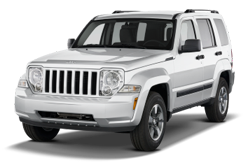 The Jeep Liberty, or Jeep Cherokee (KJ/KK) outside North America, is a compact SUV produced by Jeep for the model years 2002–2012. Introduced as a replacement for the Cherokee (XJ), the Liberty was priced between the Wrangler and Grand Cherokee. It was the smallest of the 4-door Jeep SUVs up until the car based 4-door Compass and Patriot arrived for 2007. The Liberty featured unibody-construction. It was assembled at the Toledo North Assembly Plant in the United States, as well as in other countries including Egypt and Venezuela. The Liberty ceased production on August 16, 2012. The next generation restored the previous nameplate of Jeep Cherokee that was always used outside of North America.